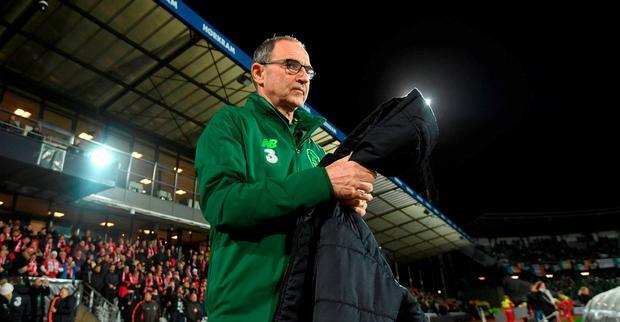 Martin O’Neill’s five-year reign as Republic of Ireland manager appeared to be at an end after he was summoned to an emergency meeting with Football Association of Ireland chief executive John Delaney late on Tuesday night. O’Neill, who led Ireland out of the group stage of the European Championships for the first time and was just one game away from qualifying for their first World Cup since 2002 this time last year, has endured a torrid 2018. The former Celtic, Leicester City and Aston Villa boss and his assistant Roy Keane have been on the receiving end of mounting criticism in recent months, with attacks on both the style of football and their coaching methods reaching a crescendo following the goalless draw with Northern Ireland in Dublin last week. Ireland have not won a competitive game in this calendar year and have not scored a goal for more than five hours, form that has led to widespread calls for their removal in the media ahead of the Euro 2020 qualification campaign. O’Neill had vowed to regroup over the winter and was confident he would be able to secure qualification for the European Championships in 2020, but the FAI is worried he is no longer getting the best out of his players and ordered him to attend the meeting at a hotel in England on Tuesday night to discuss his future. Telegraph Sport understands that Delaney was alarmed by the fact only 31,000 people attended last week’s friendly match against Northern Ireland and hopes to avoid prolonged attacks on the competency of the FAI by changing the management team. Although there have been no chants calling for O’Neill and Keane to be removed during Ireland games, banners criticising the FAI and Delaney were confiscated at the goalless draw against Denmark on Monday night. Sources close to the FAI have told Telegraph Sport that has helped persuade Delaney to accept that the team needed a change in leadership with O’Neill’s coaching staff – including former Manchester United captain Keane – also set to lose their jobs. There will be a lot of sympathy for O’Neill. The majority of players in the Ireland squad do not play in the Premier League, while the lack of a natural goalscorer, following the retirement of Robbie Keane in 2016, has been a huge obstacle to overcome. O’Neill has repeatedly been asked to leave the Ireland job by English clubs since he took charge in 2013, but rejected offers from Leicester City, Nottingham Forest and Stoke City as he did not want to break his contract with the FAI.